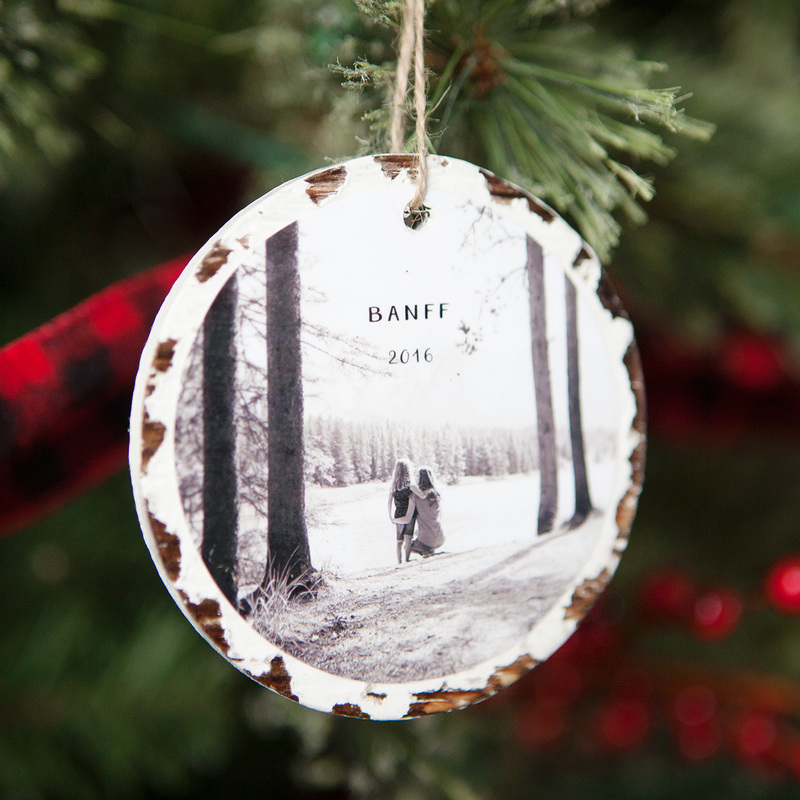 Trim the tree with these 10 minute photo keepsake ornaments. 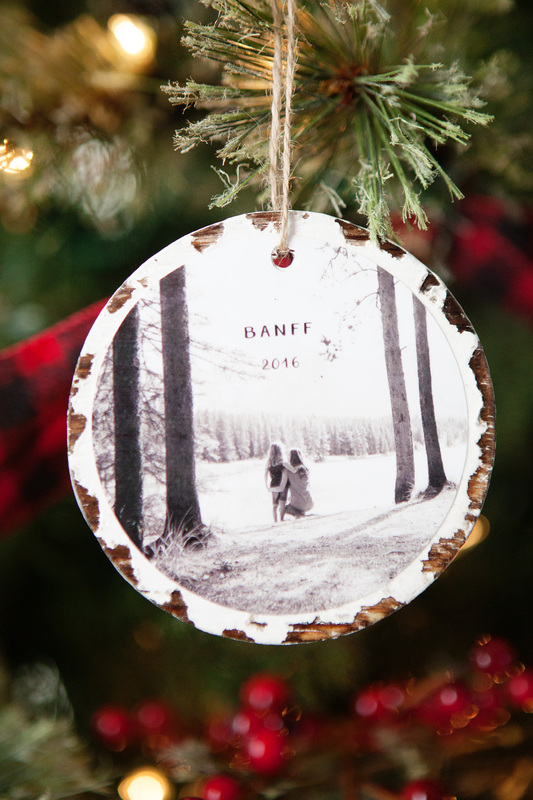 They take no time at all to make and it will mean so much to fill the tree with family memories! 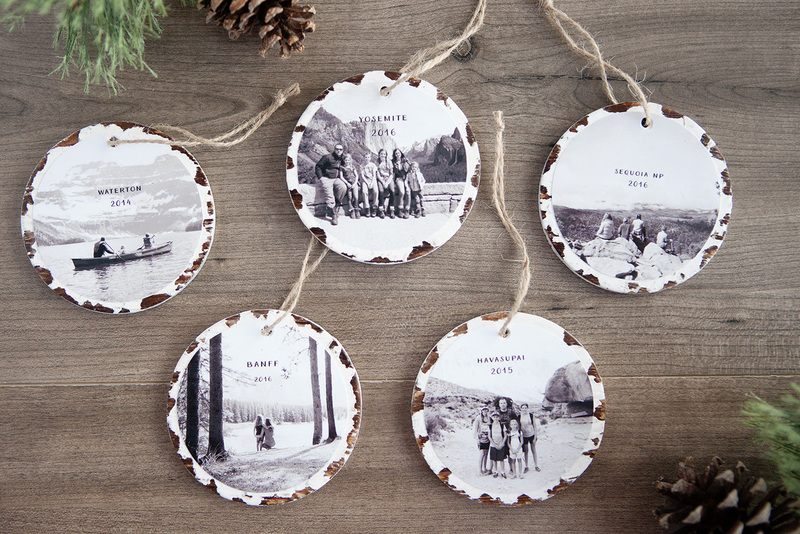 When putting together our Outdoor Adventure-themed Christmas tree this year I wanted to include some handmade photo ornaments that showcased a few of our favorite moments in the great outdoors. These photos mean so much to me and represent some amazing experiences we’ve shared together as a family so I wanted them to have a special place on our tree. 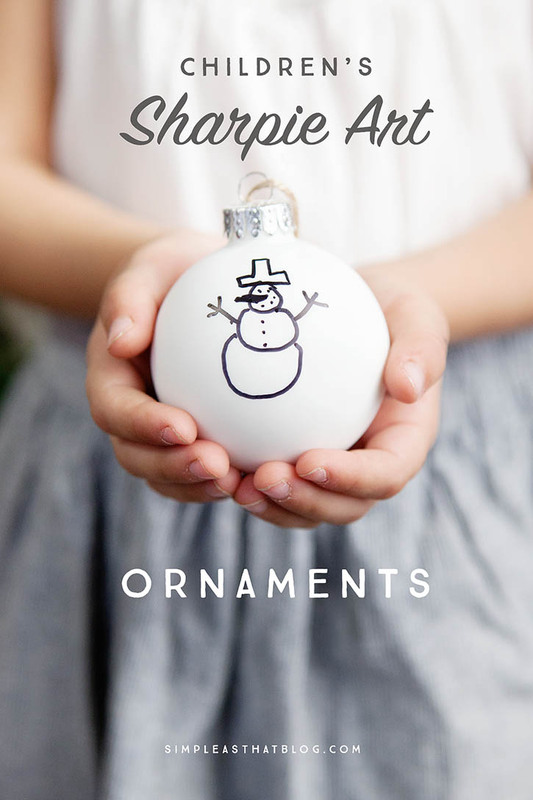 As always, when I take on a craft project, it has to be simple and these ornaments are exactly that. 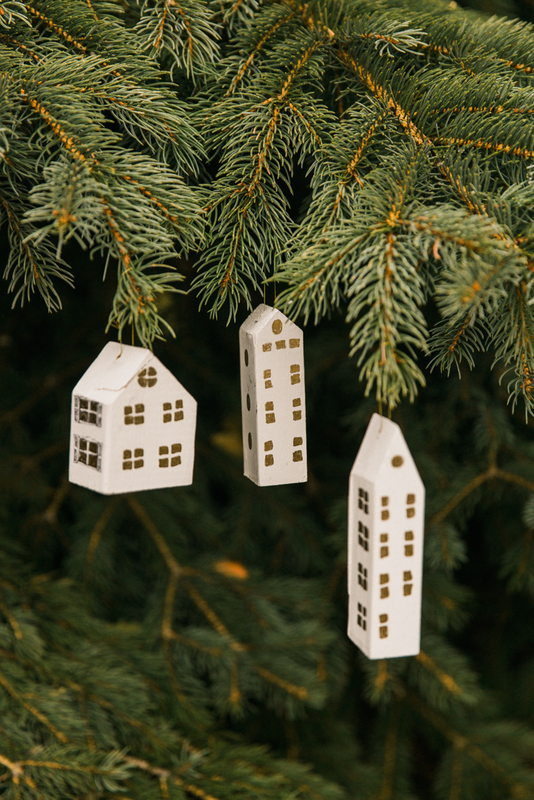 You’ll have them put together and hanging on your tree in minutes! Follow along as I show you exactly how to make them. *All supplies for this project can be found at Michaels Stores. 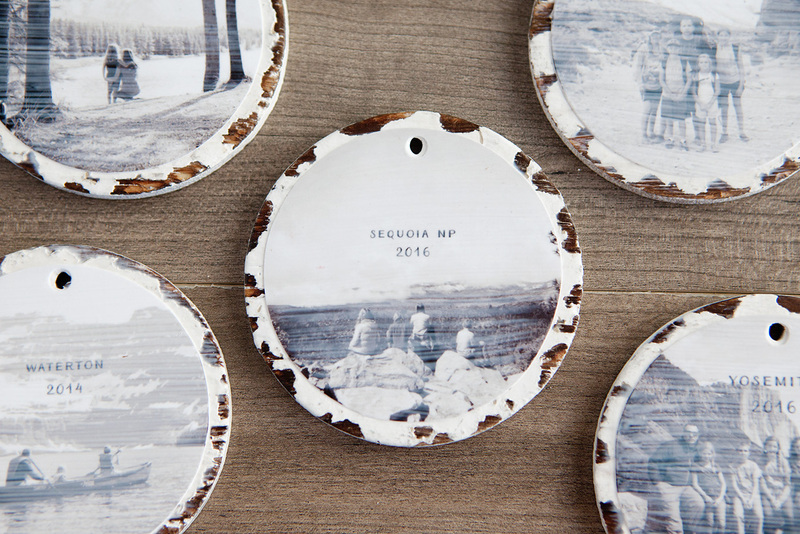 The first thing to start with is choosing the photos you will use for your ornaments. I picked out a handful of photos taken in our favorite National Parks that we’ve visited and from hikes we’ve done as a family over the years. I cropped the photos into circles using my photo editing program and chose to add some simple text telling where and when the photos were taken. You can do this in your favorite photo editing program (I use photoshop or photoshop elements) or you can do it online using PicMonkey’s free text editor. Print your photos at home or at your local photo lab. 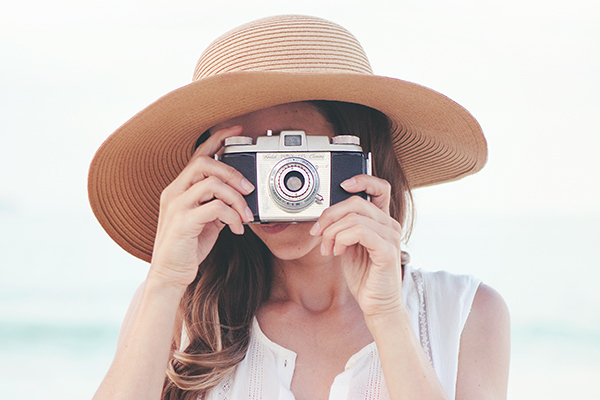 To print as a standard size simply copy and paste your circular photo onto a blank 4×6 canvas (in your photo editing program) and save as a JPG file. You can then upload this 4×6 to your favorite online photo lab and have it printed as a standard 4×6 size. 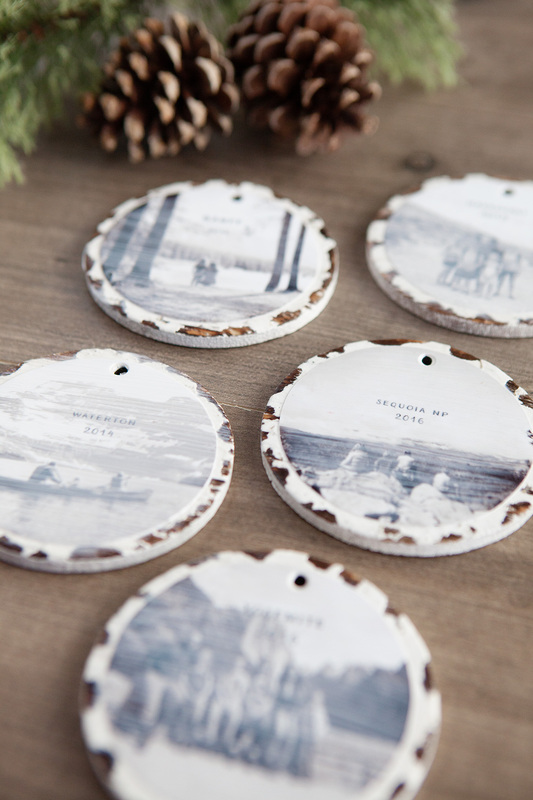 Purchase distressed round disc ornaments. 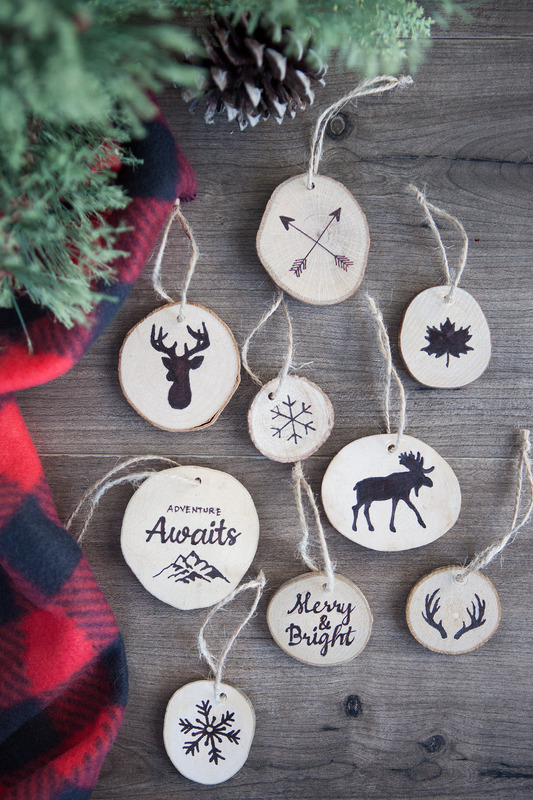 If you can’t find these at your local Michaels craft store, I did find these wood ornaments that you could paint white and distress yourself. 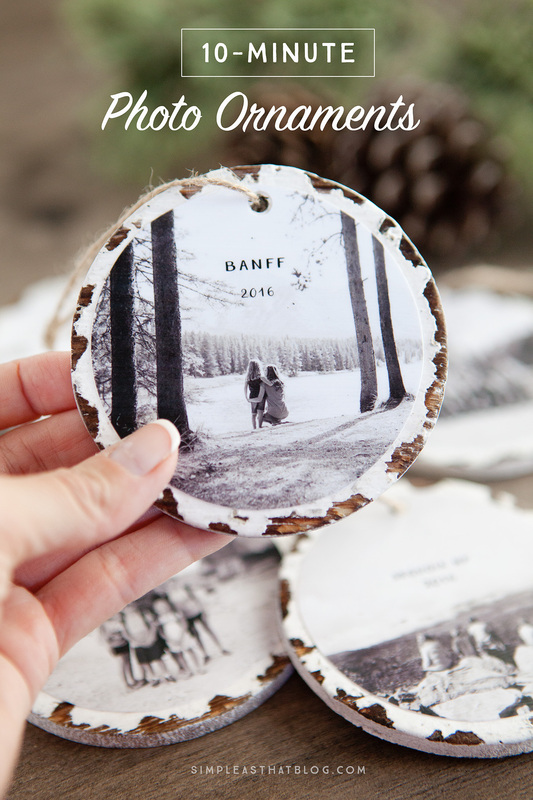 Cut out your circular photos and punch a small hole at the top in line with where the hole is on the ornaments. I used a sharpie to mark this. 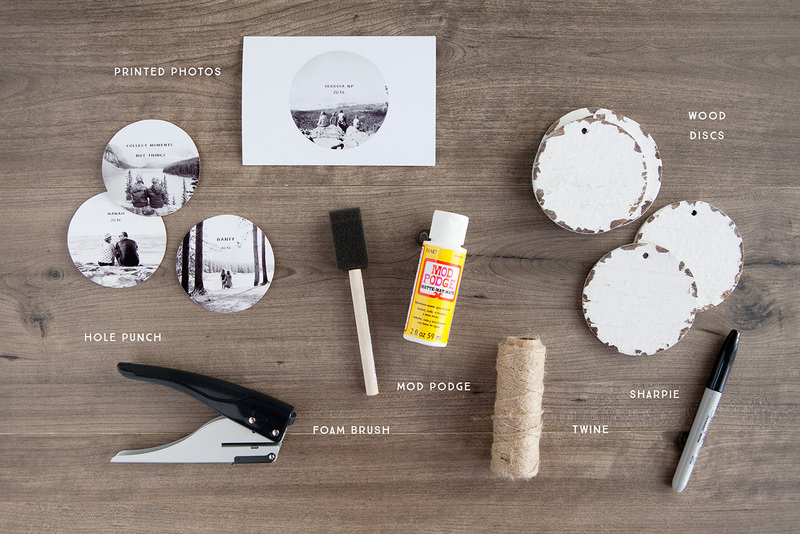 Now apply a generous layer of Mod Podge to the top of the wood ornament. You’ll need to work quickly here, making sure your mod podge coats the surface of the ornament entirely and that you have an even layer. Next apply a quick layer of mod lodge to the back of your photo. Place the photo on the wood ornament making sure it’s centered. Apply a final layer of mod podge on top of the photo to seal it. Make sure you apply this layer evenly and that your brush strokes and even and are all going in the same direction. Once the mod podge is completely dry thread a length of twine through the hole at the top of the ornament and tie in a knot. 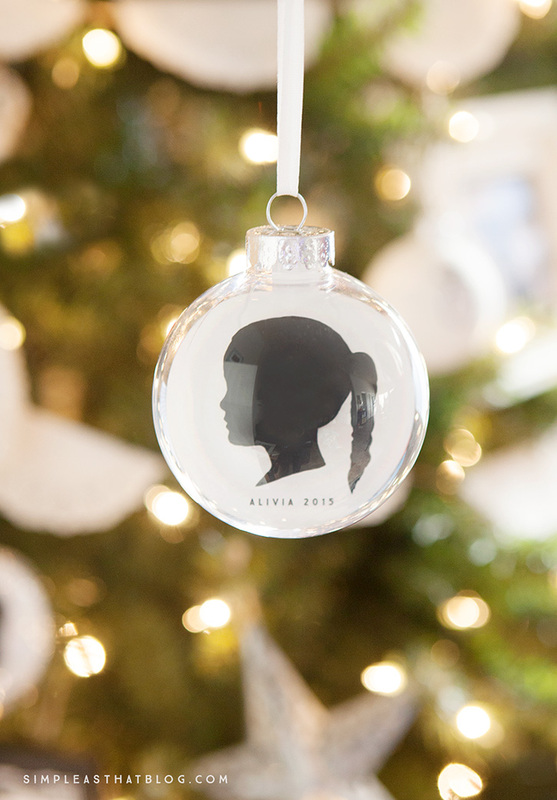 Now hang them on your tree and enjoy looking at some of your favorite photo memories throughout the Christmas season. Love these! I hope my Michaels store has the ornaments! What is the diameter? Did you print these on photo paper? Yes. I actually ordered them at my local photo lab. These are so beautiful and look easy to make. I bought all the supplies today and can’t wait to make them. Thank you so much for sharing this project!!! Where did you purchase the wood discs?? How did you cut the circles so perfectly. These are amazing, and I want to try! Try using a 2 inch hole stamper found at craft stores. I love them. What a clever idea. I am in the process of doing a memorial ornament, and these look wonderful. I may consider this. I love this so much!!! What size were the circular photos? I know you said print on a 4×6 canvas but what size did you crop the actual photo to on Photoshop? Where can I find the round discs?? Would you necessarily have to use photo paper? Would regular paper work? Yes, I think you could print on white card stock. I have another project that I have been looking for the perfect font for, would you mind sharing the font name? I love love love these!!! Would you mind sharing the font you used on these? They are precious ! I found a drawer full of spare pics and used them for the ornaments. I give ornaments to family every year but these are most personal.. I found wooden disks from amazon in a pack of 100. But how do I print my picture in a circle? Just as the video shows. Hi Rebecca, did you give your disks a couple of coats of paint. Did you use flat or a low sheen paint? Am going to print on gloss photo paper would that be ok? They look wonderful and am going to give them ago as I’m not that good with craft. Did you use black and white photos? Can you use color photos or only black and white? I’ve never printed photos at a photo lab before. To get these exact pic sizes so they’re able to be put on ornaments. What should I tell the person that’s helping me out. Thanks so much!! I think these are really nice and I thank you for sharing. I think you could use can lids, removed with the side cut can opener, to make these, too. I did something similar years ago with my kindergarten Sunday school class. Could you use regular printer paper for this? Yes, I totally think you could Amber! What size are your distressed round disc ornaments? Love your ideas. Do you have a home printer for your photos? If so, what brand and model do you use? What is the process you used to paint and distress the ornaments before you modge podge? These are beautiful!!!!! I need to learn how to distress the wood for the ornaments? Please let me know as I have everything else and would like to get started. these are so gorgeous! however, that whitewash deckled edge is very time consuming to produce and I couldn’t find any reference to one like that at Michael’s or even in a general search for them that are as nice as those. 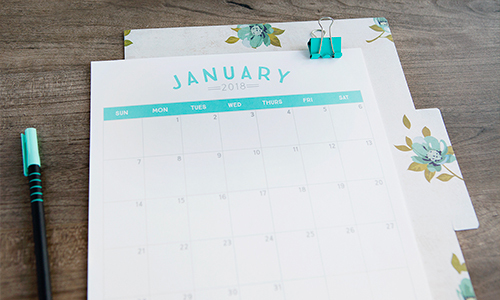 has anyone found those kind of edged wood slices anywhere THIS year, 2017? If anyone finds a new source, please share! I think it makes all the difference in the look of the ornaments. thanks! I ordered real wood slices from amazon 3.5-4 inches. No need to paint just let the wood grain show on the edges. They turned out lovely. I used a decorative upholstery tack on the top to attach twine to. Your ornaments look awesome – nice work! 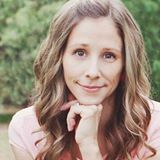 And thanks for the inspiration – been working on some personalized gifts for Christmas this year and this idea works great because I need easy, too! Happy fall! very pretty I love this idea. you could use mason jar seals as well! I tried this and when I put the modpodge on top of the photo it turned it a milky white colour. I am using matte mod podge. Any suggestions? hey there, Reviving these! 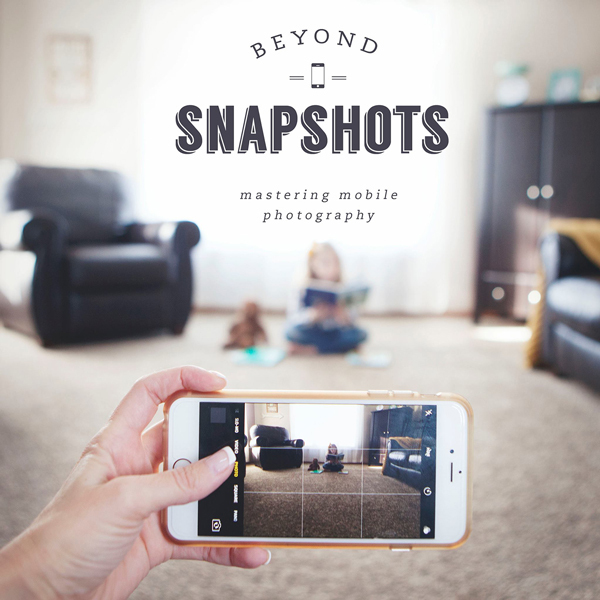 so…how do you print on the photos, in the photo lab you use? I love these sweet and beautiful ornaments. Pinning!